As his two boys cavorted around its decks, I asked David, a potential buyer, why he was considering the 560 for a world cruise. “It’s the biggest boat my family and I can sail without a professional crew,” he said. Sporting three separate outside social areas, a sybaritic saloon and a voluminous four- or five-cabin layout, this cat certainly has a megayacht feel to it. Thanks to the boat’s 7ft freeboard, the flybridge area above the cockpit towers overhead at the dock. Yet the naval architects at VPLP have managed to integrate all that height into a very attractive package. Above the waterline, the Lagoon 560’s construction features an infused balsa core and multi-directional roving, which keeps the structure strong, stiff and light. Below the waterline, solid glass is the rule. Isophthalic/NPG gelcoat and vinylester resin is used to resist blister formation. Worth noting is Lagoon’s bridgedeck “gullwing” approach to mitigating slamming, a problem all cats face to some extent. A centerline beam at the bow carries the staysail, a genoa and a Code 0 furler, as well as the anchor roller, which is set well forward so chain and hook can be cleaned as they are raised. Aft of the tramps, there are huge lockers with plenty of room to stow deck gear and fenders. One locker houses a generator and an electrical panel. In a well set into the bridgedeck, there’s also a seating area for several people to enjoy the sun. Wide side decks lead aft to the spacious teak-decked cockpit, where a U-shaped dinette seats six to eight people. Steps in the transoms lead down to the water’s edge. A neat feature on our test boat was a “Tender Lift” hydraulic platform that lowers into the water and onto which you can drive a dinghy prior to hoisting it aloft. When not used for the dinghy, it can be lowered to water level and used as a swim platform. Up a spiral staircase from the main deck, the flybridge is sure to attract guests. 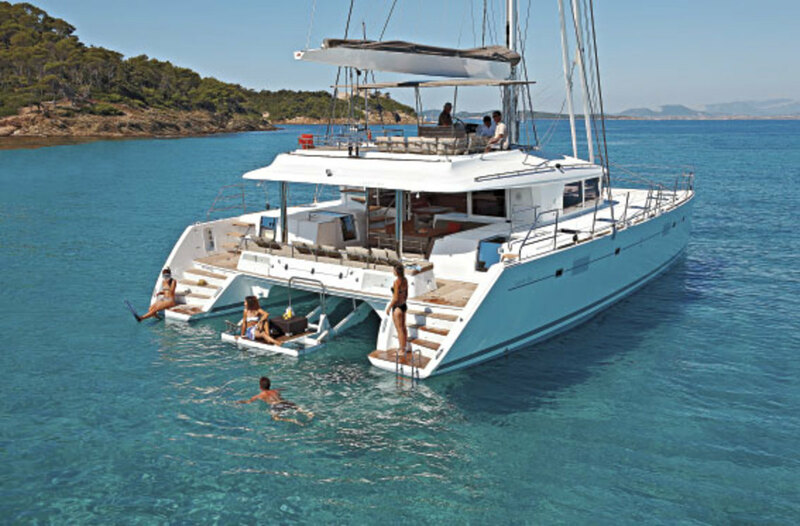 With the skipper’s business area forward, there’s room for a crowd on comfy seats and a huge sunbathing pad aft. A canvas top helps protect everyone from the sun, although the helm station will be somewhat exposed in heavy weather. Peering through the Lagoon’s signature vertical saloon windows is akin to taking in a panoramic view from a penthouse living room. The wide cockpit door slides out of the way to reveal the saloon and galley. To starboard, the L-shaped galley boasts a four-burner propane stovetop above a large separate oven. The view from the double sink and dishwasher aft will encourage volunteers to wash—or rinse—up. An island counter provides the chef with yet more work space as well as room for a small stainless steel refrigerator and a 32in flat-screen television facing the settee. To port, there’s seating for eight around a good-sized dinette table that can be lowered and folded down to coffee-table size. Forward in the saloon, a small nav station affords excellent all-around visibility. A joystick for steering, an autopilot control and throttles for the two engines allow the boat to be operated from inside when the weather’s bad. From the full-width dashboard, a pair of instrument pods pop up: the starboard pod holds a chartplotter and sailing instruments; the port pod features a touchscreen display by MultiPlex that allows the skipper to monitor and control the boat’s electrical systems and tankage. Moving down the starboard hull, the first thing you see is a sole-to-ceiling wine rack next to a full-size refrigerator/freezer. 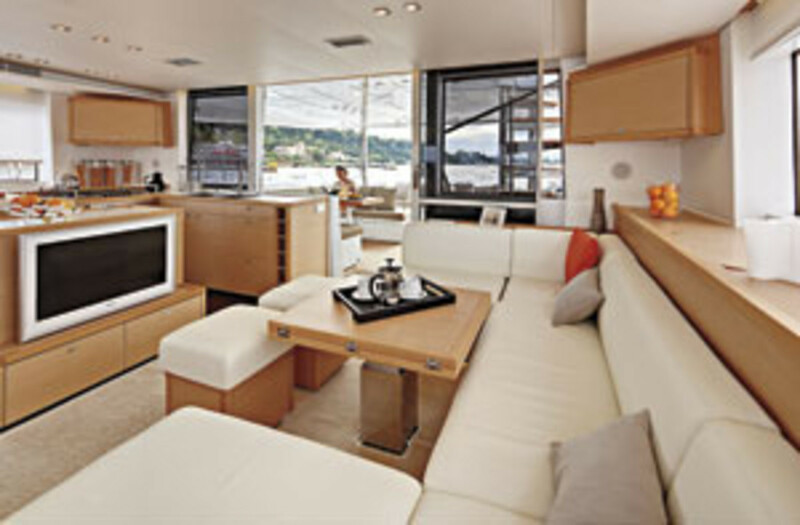 A right turn to the spacious master cabin takes you to an athwartships queen-size berth. All the way aft, a companionway to the deck separates a shower compartment and a rectangular sink. Forward and outboard are a vanity and the head. Inboard is a pair of hanging lockers. Forward, the second cabin has another athwartships queen and a more conventional head. My favorite spot below was the VIP cabin in the stern of the port hull. This can be accessed only from the cockpit and features a fore-and-aft queen-size berth nestled against the forward bulkhead. Aft, in the outboard corner of the cabin, sits a large vanity opposite a pair of hanging lockers. All the way aft is the head with a separate shower. 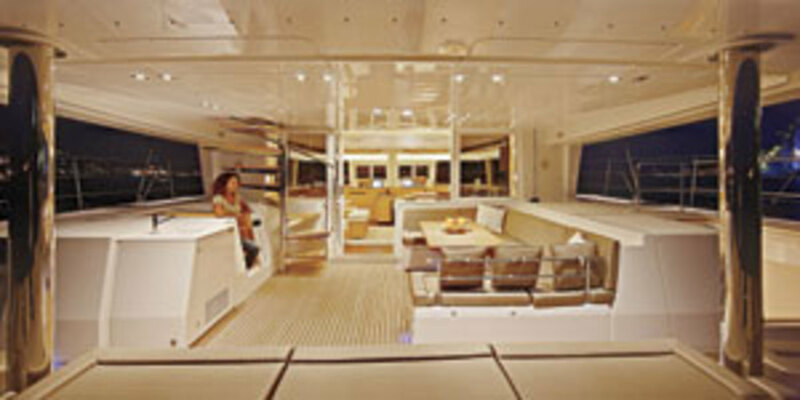 The companionway from the saloon to the port forward cabin can be closed off with a sliding pocket door. Even larger than the opposite cabin in the starboard hull, it boasts hanging lockers on the aft bulkhead that isolates the two port cabins. In the five-cabin layout, upper and lower single berths and another head and shower are inserted between the two port cabins. This steals a little room from each, but still leaves plenty of space. Hatches overhead and ports in the hull let plenty of natural light and air into all the cabins and the saloon. LED fixtures throughout provide a nice quality of light at night while drawing little juice from the batteries. Out on Miami’s Biscayne Bay, we hoisted the huge square-top main and unfurled the genoa, accelerating to a respectable 4.2 knots in 6.5 knots of true wind. That was fine for a while, but my French hosts wanted to play, so we unfurled a giant gennaker. Sailing at a true wind angle of 75 degrees, we were soon going almost as fast as the wind, with the twin hulls slicing cleanly through the slight chop. Sail handling was easy, with all the lines led to Harken electric winches on either side of the flybridge near the big Carbonautica carbon fiber wheel. Tails from sheets and halyards stow in mesh-fronted boxes built into the deck. Though the Lagoon 560 displaces close to 70,000 pounds, it is still very maneuverable. Aft-pointing cameras on our test boat give the helmsman a view of the sterns via a video display on the bridge—a handy option when navigating tight quarters or docking stern-to. Capt. Herve, who had just sailed the boat across from France, said he was able to get 6.5 to 7 knots out of the boat at 2,000 rpm on one engine, burning about 1.3 gallons per hour, which gave him a range under power of more than 1,700 miles. We motored out the cut at nearly 8 knots, with both engines running at 2,200 rpm. Gazing affectionately at his sons lying on the trampoline forward, David’s satisfied smile as we returned to the dock suggested that he should be moved from the “potential buyer” to the “probable buyer” column. 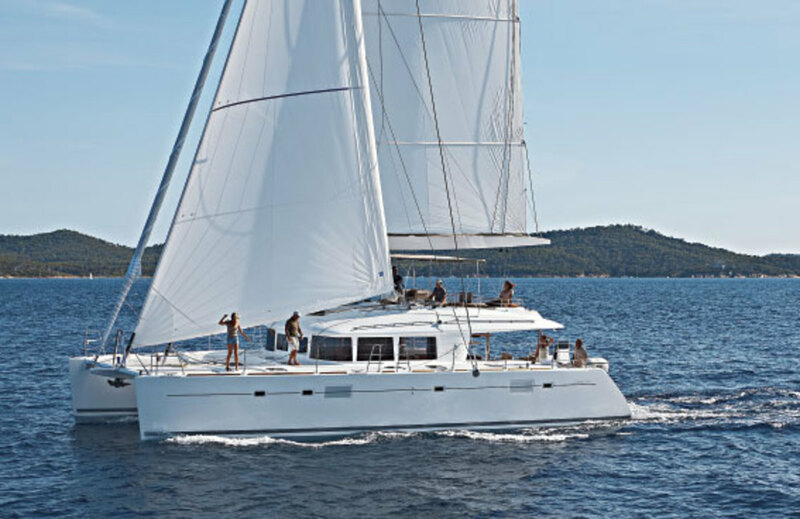 An afternoon sail and tour aboard this luxurious sailing machine made it easy to see why.